World in Motion: Does your breakfast make you amazing? Does your breakfast make you amazing? Good morning!! So each morning I have these posts but I have never really posted any morning ads...well today you are in luck! Thursday's question of the day is "Does your breakfast make YOU amazing? Mine certainly does...breakfast of champions! Actually in all seriousness, breakfast is crucial if you want to survive the morning grind at work, so I highly recommend you have a good one regularly. Oddly enough, the spot I'm showing today is for Quaker Oats, and I eat that stuff on a regular basis. So with that said, take a look at this somewhat inspirational spot that gives off this energizing feeling like GO do something with your day! And make sure it's amazing while you're at it. Anyways, would love to hear your thoughts as always. Be amazing today! This spot reminds me of your post a few weeks ago about late-night sports (the product was an athletic shoe, if I'm not mistaken): beautiful images of a mostly overlooked time of the day. Except that the shoe ad had more young people. 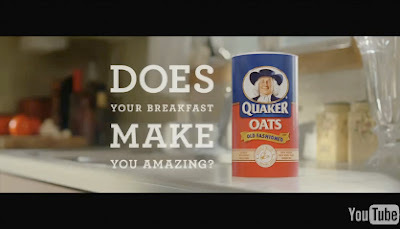 Not much inspires me these days, but this Quaker Oats ad almost made me fall in love with mornings. There's something unsentimental in its sentimentality that appeals to me ... I can't explain. Still, me likey. Thanks for the comment Cliff. You make a good point, it does resemble the Puma spot quite well. I don't know about you but the commercial certainly puts an extra boost into my mornings!